Our Congratulations go to the 2014 Pace Energy Team that advanced to the Elite 8 at the Energy and Sustainability Moot Court Competition! 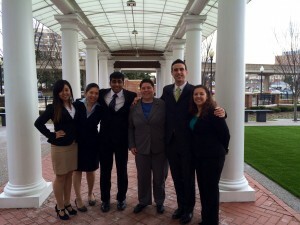 Over the weekend of March 29-30, 2014, Pace Law School sent two teams to the Energy and Sustainability Moot Court Competition in Morgantown, WV, hosted by West Virginia University. Michael DiCato (3L) and Andrea Rodricks (2L) made up one team, while Levan Thomas (2L) and Ellen Liang (2L) were members of the second team. Andrea Cerbin, staff attorney at the Pace Energy and Climate Center, coached the two teams, with Ellen Zhang (3L) assisting as a student coach. This year’s problem included complex Clean Air Act and Clean Water Act issues with a related common law nuisance issue. The two teams went up against schools including American, Notre Dame, and Duquesne, who ultimately won the competition. Michael and Andrea advanced all the way to the Elite 8, losing by a single point to the team that had the overall best oralist. Next Congratulations to the Pace First Voir Dire Team!